Has someone offered you a gift copy of Stubborn Perseverance? Indicate your preferred format below. We’ll let your friend know you accepted their gift. 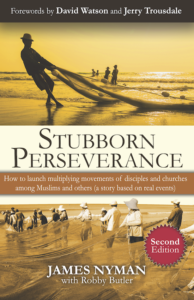 Learn how YOU can offer copies of Stubborn Perseverance to your friends. This CPM model follows the principles in Donald McGavran’s Bridges of God, allowing the Gospel to flow through natural cultural networks. Everyone who feels called to evangelistic outreach should read this book!